PIKE COUNTY, Ohio — As the investigation into the "execution-style" shooting deaths of eight members of a Pike County family continues, more questions are emerging about the family, who committed these crimes and what’s next for the three young children who were spared in these killings. The victims — all members of the Rhoden family — were found Friday at four different locations in Pike County, which is about 100 miles east of Cincinnati. Here are seven mysteries that have spawned from this case. This article originally appeared in the Journal-News , a news partner of WCPO. 1. What clues at the scenes led investigators to determine these were planned, sophisticated, “execution-style” killings? The dead included seven adults and one 16-year-old male, most of whom were executed while in bed. All appeared to be shot in the head “execution-style,” Ohio Attorney General Mike DeWine said. Autopsy results are expected to be released Tuesday or Wednesday. “This investigation is very large, probably the largest in Pike County we have ever been a part of,” Pike County Sheriff Charles Reader said. Reader said he suspected the killings were targeted and none of the victims appeared to be suicides. All the killings occurred during the nighttime hours. According to Wikipedia, an execution-style murder — also known as Chicago-style murder and execution-style killing — is an act of criminal murder where the perpetrator kills at close range a conscious victim who is under the complete physical control of the assailant and who has been left with no course of resistance or escape. Oftentimes, the victim is put on their knees. 2. What was the size of the grow operation discovered that determined it was professional, not for personal use? DeWine said marijuana grow operations were found at three of the four crime scenes, but he did not disclose the amount of drugs found. “We have received over 100 tips, we have conducted over 50 to 60 interviews … over 100 personnel were involved in this investigation. Five search warrants have been executed, four crime scenes have been worked,” DeWine said. Also, 18 pieces of evidence are at the Bureau of Criminal Investigation’s state crime lab. 3. Why were the children spared by the killers? Where are the children now? In all, three children — the 4-day-old, a 6-month-old and a 3-year-old — were found unharmed at the scenes, officials said. It is unclear at this time why the children were spared. What does that indicate about the killer(s)? Reportedly state authorities are caring for the children. 4. Who are the Rhodens? The identities of the eight people killed are: Hannah Gilley, 20; Christopher Rhoden Sr., 40; Christopher Rhoden Jr., 16; Clarence “Frankie” Rhoden, 20; Dana Rhoden, 37; Gary Rhoden, 38; Hanna Rhoden, 19; and Kenneth Rhoden, 44. 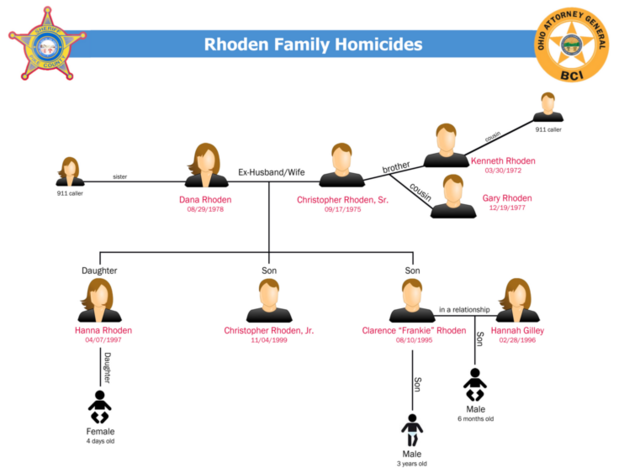 The Rhoden family is a large family spread across several counties in southern Ohio. Both Christopher Rhoden Jr. and another victim, Frankie Rhoden, 20, worked at Big Bear Lake Family Resort, according to Facebook pages, including “Remembering Frankie Rhoden.” And two victims, Frankie Rhoden and Hannah Gilley, were engaged, according to the “Remembering Frankie Rhoden” Facebook page. Reader said the family did not have prior criminal contact with his office. 5. What is the profile of the perpetrator(s)? No suspect or suspects have been apprehended. While survivors of the family are asking for the public’s help in finding those responsible and investigators continue to seek for answers, no details about the perpetrator or perpetrators’ profile have been released by authorities. Authorities are asking for help from the public to assist in the investigation. Anyone with information is asked to call (855) BCI-OHIO, or the Pike County Sheriff’s Office at (740) 947-2111. 6. How did the killers gain entry into the residences in the middle of the night? Details of how the killer or killers gained entry into residences have not been released to the public but we are working to obtain more details from the investigation through public records requests. Seven of the deceased were found in three Union Hill Road homes in Piketon. The eighth was found within a 10-minute drive from the other victims. Two recordings of the first 9-1-1 calls that Piketon police received Friday were released. The home is where two males were found dead — her brother-in-law Chris Rhoden and cousin Gary Rhoden. 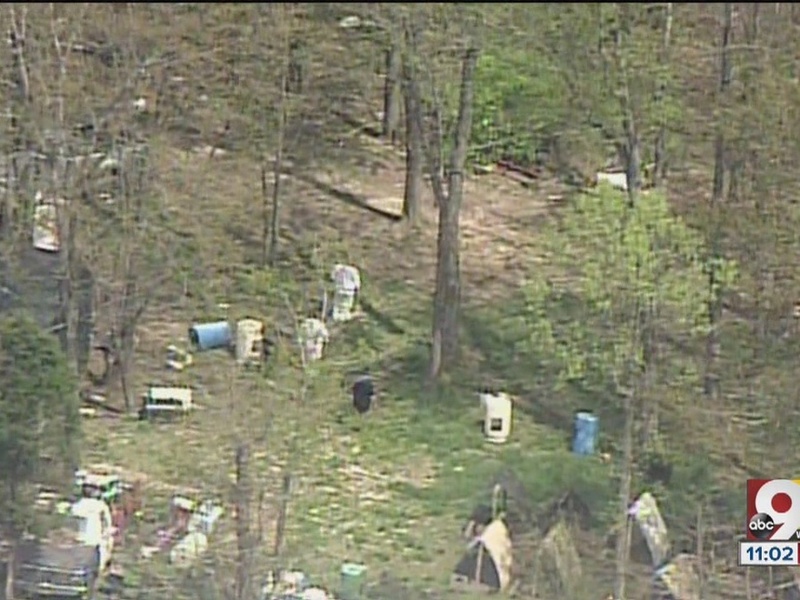 It was one of four locations where bodies were found Friday. The woman said in the 9-1-1 call there was “blood all over the house” and someone “beat the hell out of them.” The men were found lying on the floor in the back bedrooms. She reported that no one else was in the home and broke into tears, according to the 9-1-1 recording. A man is heard in the second 9-1-1 call, recorded at 1:26 p.m. Friday. The man was at a residence in the 700 block of West Fork Road. He told the dispatcher he walked in and called out for his cousin before finding him dead with a gunshot wound. The news of the other deaths had already been reported by the time this death was discovered. “All that stuff that’s on the news, I just found my cousin with a gunshot wound,” the caller tells the dispatcher. 7. What is the drug history of Pike County? In August 2012, Ohio law enforcement officers found “ a major marijuana grow site in Pike County with suspected ties to a Mexican drug cartel ,” according to a press release DeWine’s office issued at that time. Investigators discovered about 1,200 marijuana plants — which were destroyed — and they also found evidence of two abandoned campsites they believe belonged to Mexican nationals. It has not been indicated by authorities that there is any connection between this incident in 2012 and the operations found on the Rhoden properties. RELATED: Is Pike County a dangerous place? Piketon is a community of 2,158 in Pike County, which has 28,217 residents, according to the 2015 census. The county is classified by the Appalachian Regional Commission as “distressed” and the unemployment rate is among the highest in the state, according to the county website. Community members said news that investigators found marijuana growing operations at three of the four crime scenes is not entirely surprising. “I’ll tell you, the drug scene in this area is just so bad that you never can tell,” said Chip Moore of Piketon. “That’s Pike County. … It’s one of those things that everywhere, really,” said Surienna Nye of Piketon.